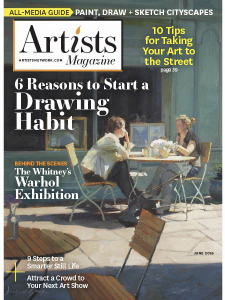 The Artist's - 06.2019 » Download PDF magazines - Magazines Commumity! The Artist's Magazine is the world’s leading magazine for serious, active artists of all skill levels. Readers learn painting and drawing firsthand from other artists through written instruction and reproduction, guiding them step-by-step through the creative process. The magazine shows readers a wide variety of creative options, teaching the fundamentals of art making, presenting techniques in different painting and drawing media.